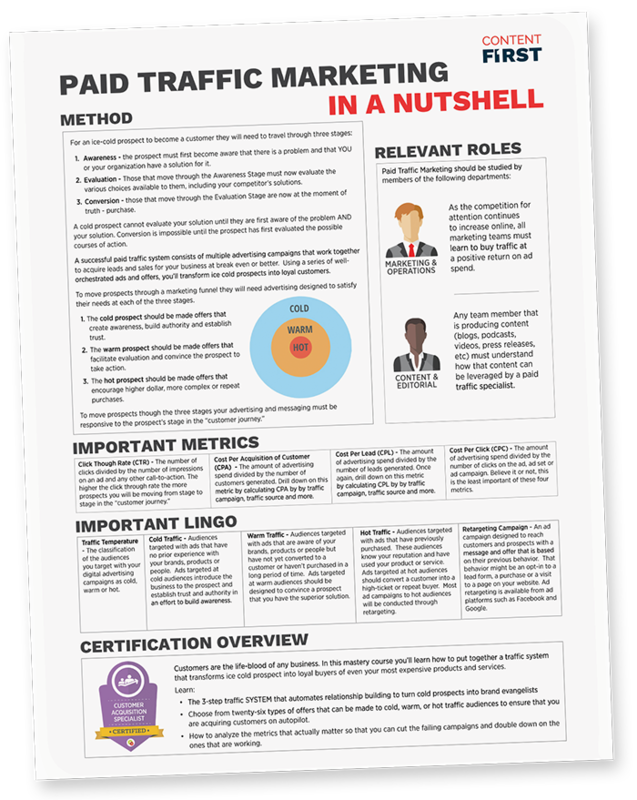 What is Paid Traffic Marketing? A successful paid traffic system consists of multiple advertising campaigns that work together to acquire leads and sales for your business at break even or better. Using a series of well orchestrated ads and offers, you'll transform ice-cold prospects into loyal customers. To move prospects through a marketing funnel they will need advertising designed to satisfy their needs at each of the three stages. 1. The cold prospect should be made offers that create awareness, build authority and establish trust. 2. The warm prospect should be made offers that facilitate evaluation and convince the prospect to take action. 3. The hot prospect should be made offers that encourage higher dollar, more complex or repeat purchases.